Typically used in high water – or by those who don’t want to get their feet wet! The Pinnacles are located in the Coromandel region on New Zealand’s North Island and climbing to the top is often included in “must do” lists for resident kiwis. Like the Mueller Hut Hike, a serviced Hut near the top of the walk makes it perfect for families and first time adventurers. The walk itself is incredibly pleasant (if not a little boring) as it winds its way through forest. 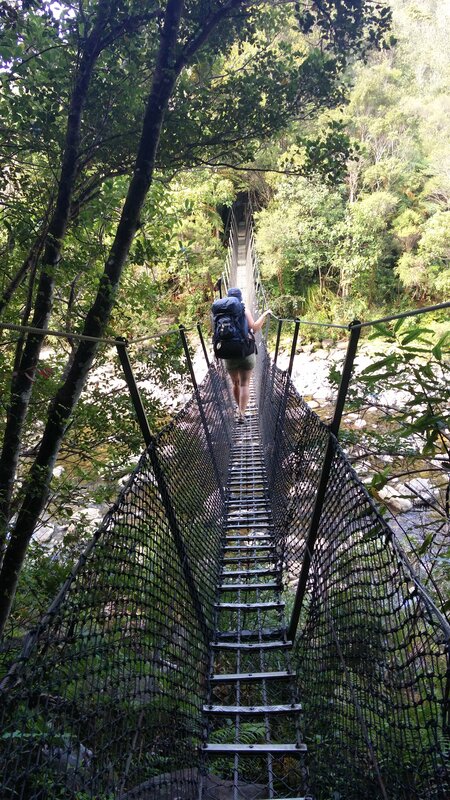 In days gone by, Kauri trees dominated the region and the track actually follows the path built for packhorses which brought supplies up to the men felling and milling the trees. Rugged stone steps dominate the walk and although these are no match for those found on the Mueller Hut Hike, be prepared for aching legs the next day! Along the way, the path crosses the river a few times, and at each there is the option of “fording” the river, or taking the rickety swing bridge “in flood” option. 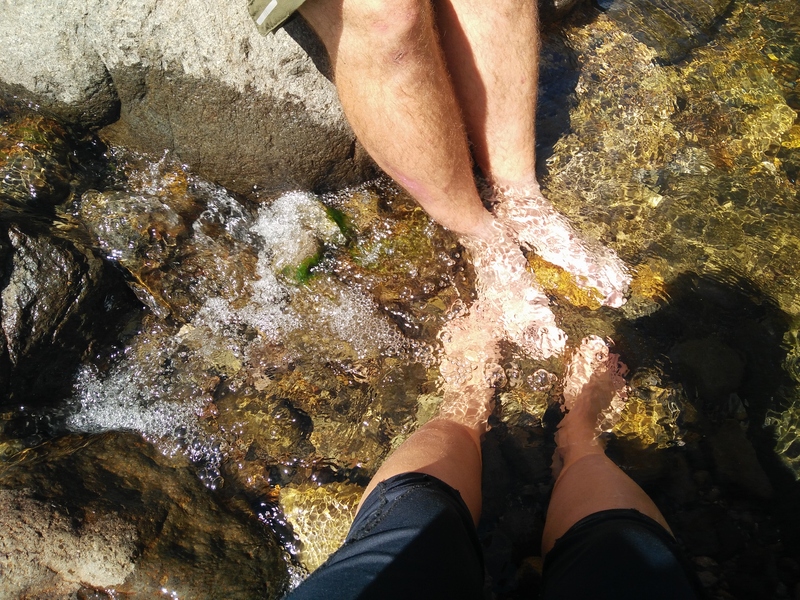 Being summer, and with no recent rainfall, we were able to walk through the water or leapfrog across boulders without so much as getting our ankles wet, but found the swing bridge option a little more fun! Occasionally a weathered sign attempted to shed light on the logging era, however these were so faded, they were mainly unreadable. Near the top, the forest fades as you reach the “Hydro Camp” clearing. From here, the path opens out more, and hikers are rewarded with impressive views across the Cormonadel. Upon reaching the Hut we dumped our bags and got acquainted with our home for the night. The Hut is one of the more luxurious that you can stay in, and in peak season will cater for up to 80 people a night. The bunk rooms consist of several long platforms onto which you throw down a plastic mattress. Whilst we were there, it wasn’t so busy, so there was space between ourselves and the next group. On busy nights be prepared to be stacked in together! There is a shower, but due to water shortages this is often out of bounds, as it was when we visited. Several long drop toilets are located a stone throw away from the main huts accessible via the raised boardwalk which surrounds the building. Water is available, but must be boiled before use – often other campers or the warden will boil huge vats at a time, which is then available as a free for all. We hiked up with our own pots and pans, but needn’t have bothered – there is a vast supply of pans, crockery and the like – probably gleaned over the years as they were left behind by previous trampers. Having started late, we quickly headed off to make the summit for sunset. From the Hut, it is a short walk up to the top of the pinnacles. Out of the tree line, the views are pretty spectacular, and the walk leaves the mundane and becomes far more interesting – but not one for the faint hearted to attempt! The steps are built into the steep path, and the last ten minutes involve climbing ladders and iron rungs cemented into rock faces. This exciting finale is in itself worth it, but the views are pretty cool too! The summit offers 360° views of the surrounding area, and the setting sun cast a beautiful orange glow across the landscape. We watched for forty minutes as the sun dipped below the horizon, heading back to our dinner in the dimming light. Following dinner, we checked out the stars, and were rewarded, as on Mueller Hut, with clear skies and beautiful star studded canvas. Taking star photos took up a good chunk of the evening, and so headed to bed. Ian was adamant that the sunrise wouldn’t be worth the early get up time, so I set an early alarm to attempt the mission solo. Giving myself just half an hour to make the summit attempt from waking meant even with running, I cut it a bit fine, finding myself a spot on the rock face mere seconds before the sun gracefully rose into the morning sky. I watched alongside a few other early birds as the long shadows faded and another beautiful day was born. A gentle jog back to the bottom meant I was back in time to make a brew before Ian’s sleepy head made an appearance. We decided to take the Billy Goat track back down, which diverges from the Webb Creek track at the Hydro Camp. A word of warning here, be ready for a significant amount of “ascent” before the actual descent begins! This initial uphill really threw us, and although there had been no other “track” to take we stopped to ensure we were heading the right way. We had to resort to using our phones (we did have a compass, but no real map) to read some previous reviews and then check our location on google maps before convincing ourselves we were indeed on the right path! The path itself is similar to the Webb Creek track we had taken up the previous day. Steep inclines with rough cut steps mark a clear path through native woodland. Part way down a recreated example of a skid road alongside more fading signs, give an insight into the interesting history of the area. There is also a rough campsite, with loose gravel marking a few pitches, which must be booked in advance through the DOC. At the end of the track, a final river crossing gave us chance to dip our aching feet in the cooling waters which bubbled serenely by. In flood, the amount of water surging through would make a river crossing too dangerous, and with no current floodwater bridge a very long detour back up to Hydro Camp and around would be the only option in reaching the almost visible end. Work is underway to repair/replace this bridge, but in the meantime warnings to take the Webb Creek track should be heeded after any significant amount of rainfall!